This former railway workers cottage will appeal to steam railway enthusiasts, walkers and families alike. Located in a quiet hamlet, surrounded by fields & footpaths at the gateway to the North Yorkshire Moors National Park, but within easy walking distance of Pickering, with its supermarkets, traditional pubs and wide choice of restaurants. The cottage gives an exclusive front-row seat of the majestic steam locomotives of the NYMR, which proceed at "snail's pace" past the cottage and provide great entertainment for children, young & old! Please note, this is a private line, the patio is fully fenced & gated, and steam trains run extremely slowly from approx. 9am to 5pm, during tourist season. The cottage is double-glazed, gas central heating & constant hot water, fully equipped kitchen & lounge/diner with satellite TV, open fire & additional sofa-bed. 2 bedrooms (1 double/twin & 1 with adult bunks). Parking for 2 vehicles & private patio with BBQ. No pets. We are a family of four, living in the beautiful South West of Ireland, but originally from England. Our extended families mostly live in the North of England and manage the cottage for us. We enjoy outdoor activities such as walking, cycling and the beach. A holiday is an important time for families, and we aim to provide an experience that exceeds expectations! We are proud that we get a large number of repeat visits to the cottage through many 'word-of-mouth' recommendations. We visit the UK a few times a year and were looking for a base that we could also rent out as a holiday cottage. Railway cottage met all our criteria. It is in a peaceful hamlet within the national park & is close to the beach & many tourist attractions. We believe that we have the best of both worlds in that there is an easy walk into Pickering, which is a picturesque, small market town, with atmospheric pubs and restaurants, but being in a peaceful area, surrounded by fields, quiet lanes and woodland walks. There is great wildlife around, and we often get visited by a woodpecker & other wild birds! The cottage has been converted and modernised in 2009 and is extremely well equipped. From the moment you arrive you will feel like you are on holiday - you cannot help but relax! Railway cottage is ideal for families, and will be a memorable holiday. It offers a rare experience to watch steam trains, on the most popular steam railway in the UK, from the comfort of the living room and bedroom as they pass slowly past the cottage. Have a look at the video on our website! Most visitors have said that they end up shouting 'train' every day, rushing to the window to wave to the passengers to see which of the magnificent steam trains is passing! The cottage is very cosy, comfortable and warm. You will be well looked after, and we have been told that we offer great value! Since first renting out the property in March 2009, we have been booked almost every week, mostly to families and train enthusiasts, and we hope you decide to visit! Bathroom with corner-bath/overhead shower, basin and toilet. Lounge/diner provides a "front-row" view of passing steam trains. There is a flat screen television with satellite TV & DVD, & IPOD dock. Metal-action, double sofabed for an additional guest (must be arranged with owner in advance). Open fireplace. Kitchen is newly fitted and well equipped, with washing machine, dishwasher, gas oven/hobs, microwave and fridge/freezer. Brigham Park, Malton Road, Pickering – 9 hole par 3 course. Easingwold Golf Club, Stillington Road. YO61 3ET – 18 hole course. Flamborough Head G.C., Bridlington. YO15 1AR – 18 hole course. Ganton G.C., Ganton, Scarborough. YO12 4PA – 18 hole course. Heworth G.C., York YO31 9JY – 11 hole course. Kirkbymoorside G.C., Manor Vale Road. YO62 6EG – 18 hole course. Malton and Norton G.C., Welham Road, Norton. YO17 9QE – 27 hole course. Scarborough South Cliff, Deepdale Avenue, Scarborough YO11 2UE – 18 hole course. Scarborough North Cliff, North Cliff Avenue, Scarborough YO12 6PP – 18 hole course. York G.C., Lords Moor Lane, Strensall. YO32 5XF – 18 hole course. Sandburn Hall G.C., Flaxton, YORK YO60 7RB – 18 hole course. Ampleforth College Golf Course, YO62 4JH – 9 hole course. Red House, Thorgill Lane, Rosedale Abbey. YO18 8SE – 9 hole course. Sawdon G.C., Sawdon, nr Scarborough, YO13 9DU – 9 hole course. Snainton Golf Centre, Driving Range & 9 hole. Notes on accommodation: We offer a holiday experience with a difference! 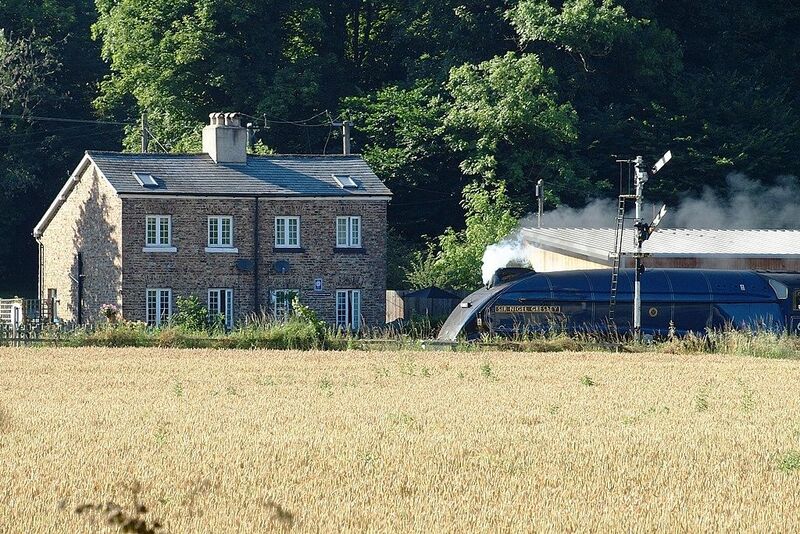 Adults & children will enjoy the excitement of the passing steam trains, which travel slowly past the house. The NYMR (North Yorkshire Moors Railway) is one of the most popular, and picturesque, steam railways in the country, and after spending time in the cottage you cannot fail to become a steam railway fan! Please note that whilst every effort has been made to make the cottage as safe as possible (i.e. the patio is fully fenced & gated), young children will still need to be supervised. Please ring us if you have any questions. Free WIFI. Outside: The cottage has an enclosed patio and a BBQ for al fresco dining. There is parking for 2 vehicles. The property is located within the North Yorkshire Moors National Park. It is surrounded by fields & footpaths. Cleaning / Towels / Linen / Maid service: Towels & linen provided (except cot linen). Cot-bed, stairgate and highchair available. Cosy cottage in an excellent position. Spent a lovely week in railway cottage for October half term. As can be seen from the photographs the cottage is in a brilliant position for seeing the steam trains traveling from Pickering (approximately a mile away so easily walkable) to Whitby, what the photo's don't show is the yard just behind the cottage where the locos for the first two services of the day are kept so you can also watch them being put away in the evening and steamed up in the morning. The cottage itself is small but plenty big enough for the three of us and very well equipped and cosy, especially in the autumn when there's a lovely open fire to keep things toasty. The owners are very friendly and helpful, we had a minor problem with the bath and they did all they could to sort it out and make sure it didn't spoil our stay. Pickering is a very central location with loads to do within a small radius, lots of nice walks very near by, many museums, castles and Flamingo land theme park and the national bird of prey centre all within twenty minutes drive or so. York with all of its attractions (use the park and ride) is about half an hour away as are Whitby and Scarborough by car, or you can walk into Pickering and get the steam train to Whitby as we did. All in all we had a lovely stay and would hope to go back again. Reasonably comfortable and well equipped. Unfortunately due to illness on my husbands part and an accident on my part we were not able to go to Pickering. We have stayed 4 or 5 times in previous years and really like the accommodation. We like being so close to the steam trains and the accommodation suits our needs. The cottage is a lovely clean well equipped cottage with everything you could need. But it''s the location which really sets it apart. If you like steam trains, you will love this place. It's position, right next to the North York Moors Railway makes it perfect as the massive trains trundle past on their journeys throughout the day. We've had a fantastic stay, cottage is well equipped and in a wonderful location and position to watch the steam trains. Exclusive views of the North Yorkshire Moors Steam Trains - local insight can be provided! We pride ourselves on providing guests with a good-value & memorable holiday experience. Please let us know if you have any special requirements and we will do our best to accommodate you. Check out our website and see how our guests have enjoyed their time with us! The Yorkshire coast is within a 20 minute drive. Visit Scarborough, Whitby, Filey, Bridlington, Robin Hood's Bay for sandy beaches and many tourist attractions. You will find a range of outdoor and family activities to enjoy. Railway Stations: Malton (9 miles); Scarborough (15 miles); York (25 miles). Airports: Leeds Bradford (62 miles. 1 hr 20 mins); Doncaster Robin Hood (68 miles, 1 hr 50 mins) Newcastle (100 miles, 2 hrs); Liverpool John Lennon(125 miles, 2 hrs 30 mins). The market town of Pickering is an easy 15 minutes walk where you will find a good choice of shops, banks, supermarkets, traditional pubs & restaurants. There is a swimming pool. A doctor's surgery is within a few minutes drive of the property. Booking Notes: A booking deposit of 30% of total holiday cost is required at time of booking. The balance is to be paid one (1) month before the start of the holiday. Changeover Day: Changeover day is Saturday but can be flexible subject to availability. Notes on prices: Prices are for the property per week in UK Pounds. Short weekends & mid-week lets subject to availability. Please see website below for details. We are happy to accommodate shorter breaks, subject to availability. As a guide, in our published tariffs, a Weekend break is 3 nights, arriving Friday & departing Monday. A Midweek break is also 3 nights, arriving either Monday or Tuesday. We are always happy to consider other requests, subject to availability.